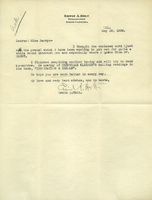 Mr. Holt tells Martha Berry that he hopes the enclosed card will interest her. He says that he has finished compiling another card of readings from Grenville Kleiser's book "Inspiration and Ideals" and will send it soon. He hopes that Martha Berry is better and wishes her the best.